It finally happened! I finally made a trip out to Ft. De Soto Park. Whether it’s on eBird on the e-mailing lists, the birding there has become legendary. Even as birding along the Space Coast has wavered these past few years, some of the lists from Ft. De Soto have been epic. Hundreds of terns. Dozens of warblers. Specialties. Rarities. Fort De Soto is essentially an island in the Gulf of Mexico south of Tampa. 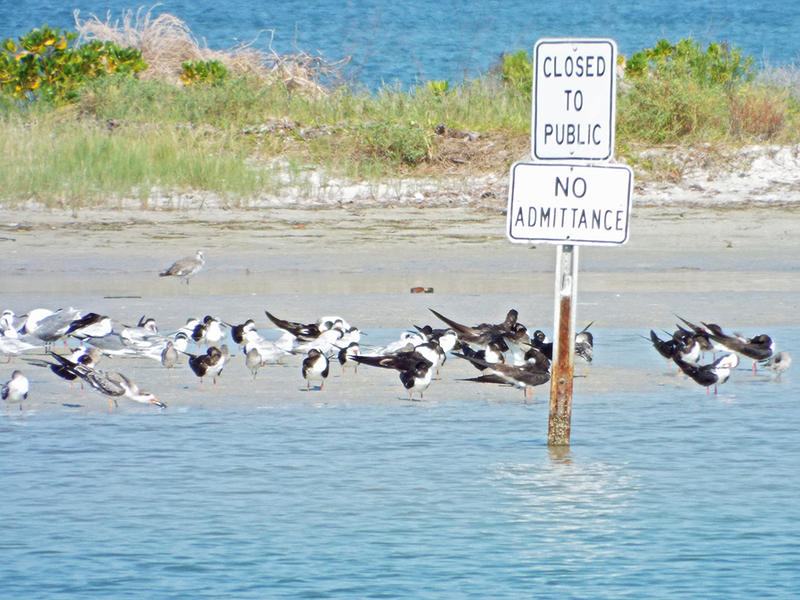 As such, it acts as a migrant trap for birds making their way along Florida’s coast. This time of year shorebirds are starting their treks south, as terns gather for their winter dispersal. We did a quick walk of the trail by the rangers’ residence in case of some early migrant warblers and such, but the trail was fairly quiet, except for the terns calling along the nearby beach. There are some benches and a fountain nearby that must be a lovely spot when migrant songbirds are passing through. 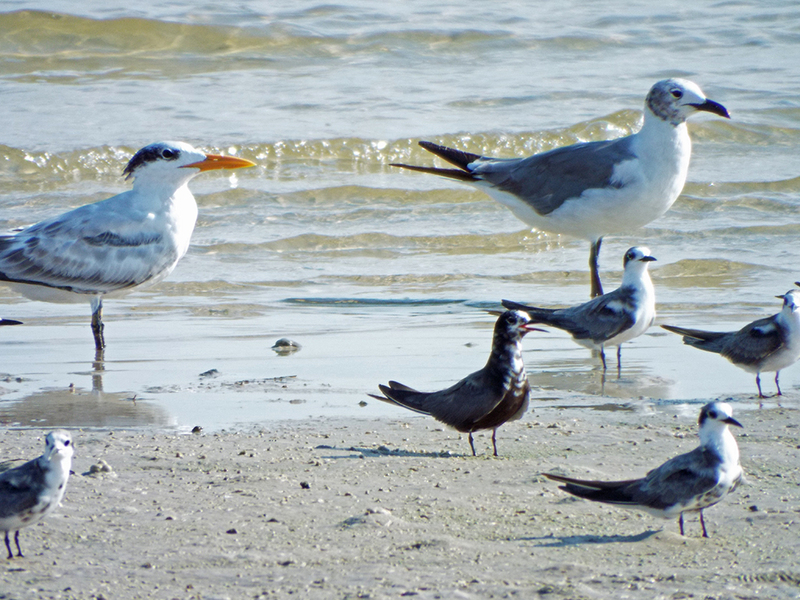 We then walked out onto the nearest fishing pier and saw some gulls, terns and Black Skimmers along the narrow beach. There were some Snowy Egrets hanging around the shop on the pier, but not much else was happening here either. A solitary immature Great Blue Heron. Young Black Skimmer near the pier. Along North Beach a lovely collection of Black Skimmers, various terns, Marbled Godwits, Short-billed Dowitchers, Semipalmated Plovers, Laughing Gulls and more were congregated on the protected sandbar. Many of these birds are the first of the year for me. In the second photo below, notice the immature skimmer resting it’s long bill on the sand – a common posture when these birds aren’t flying. 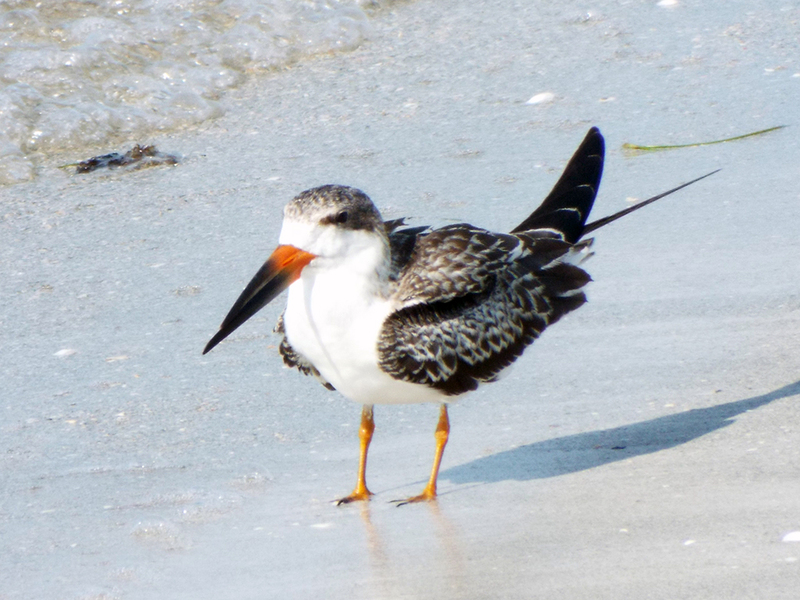 Cutest shorebird ever? 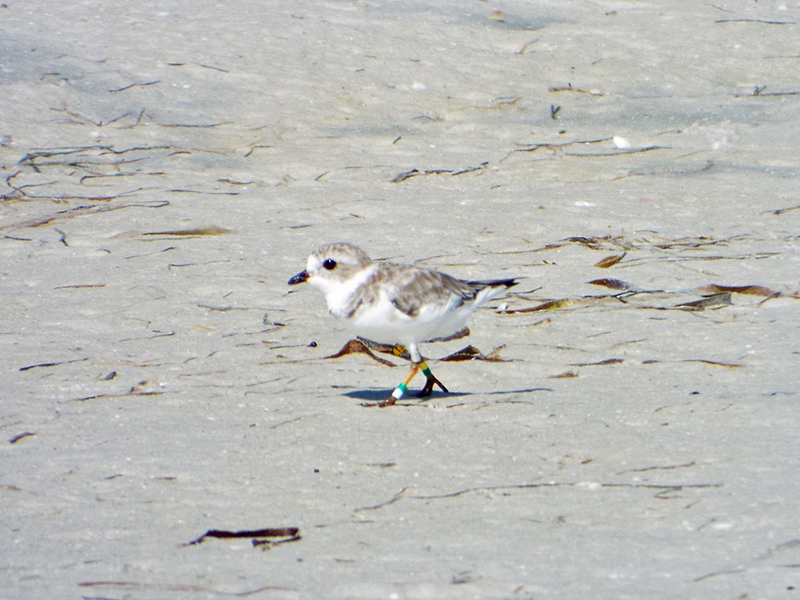 Piping Plover (note the banded legs). Lots of Black Skimmers on the sandbar. 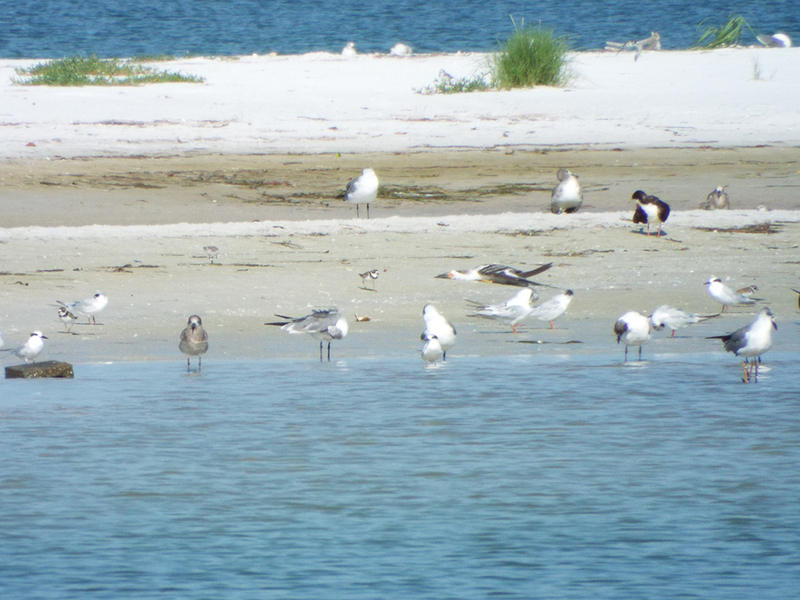 Mixture of gulls, terns, and shorebirds. 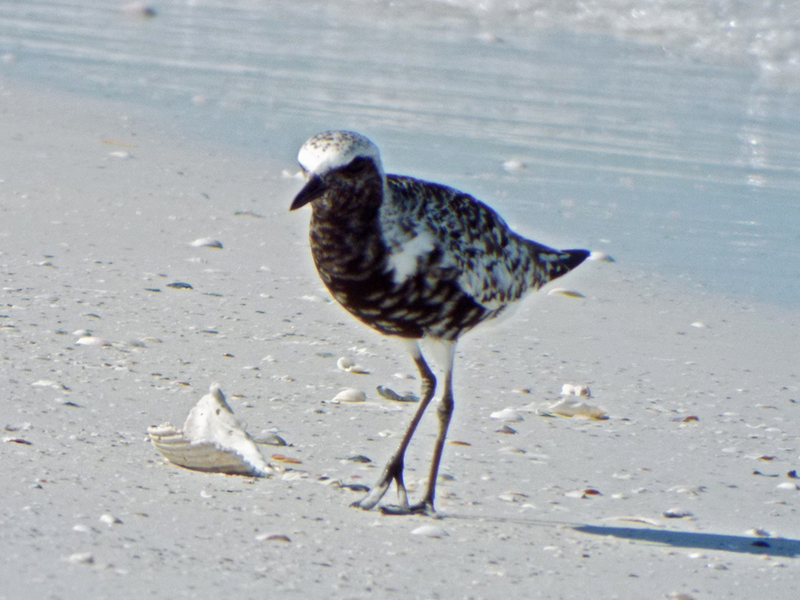 Black-bellied Plover hanging on to breeding plumage. There was a nearby mudflat full of Willets, peep sandpipers, gulls, terns and a few other shorebirds. One of the elusive species both Camille and I have been hoping to see all summer is the American Oyster Catcher. There were some very nice birders who were staked out by the North Beach sandbars with a spotting scope and educational material. They pointed out that some oystercatchers were seen at this mudflat. They also gave us some other tips that proved very useful throughout the day. Local knowledge is invaluable at times. 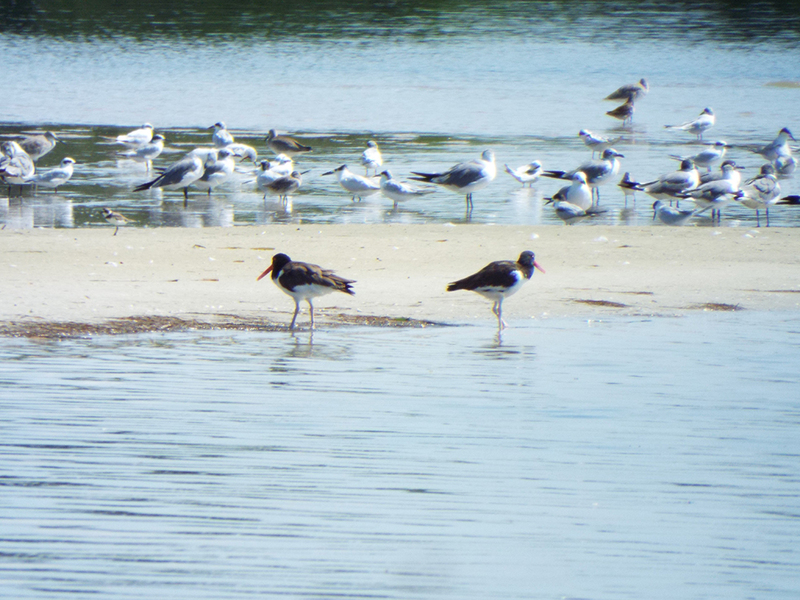 Even from a distance, the American Oystercatcher is distinctive. 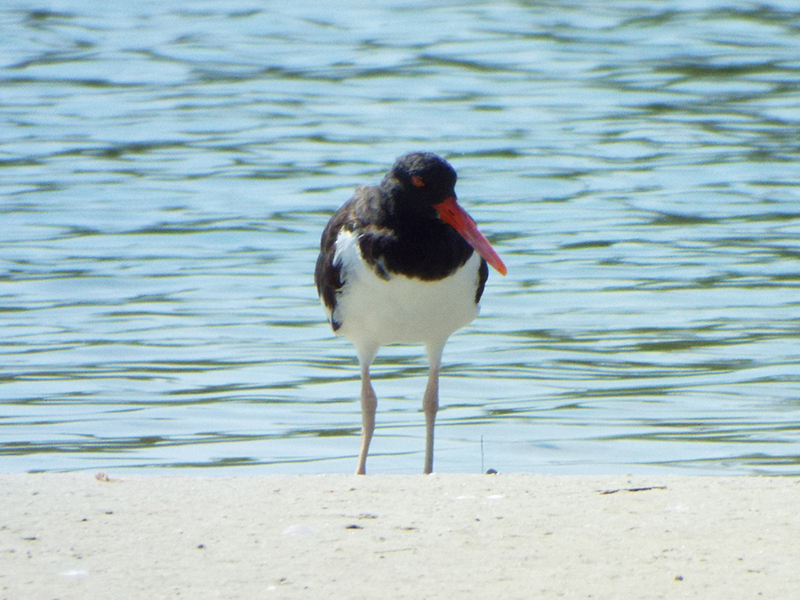 The oystercatchers’ stout, chisel-like bills are great for forcing open bivalves (e.g., oysters, clams, and mussels). As we took a break for lunch, we noticed that a large number of Magnificent Frigatebirds had begun soaring in kettle just outside the park. The women at North Beach had said that by afternoon their numbers would increase, but I was thinking maybe two dozen at most. From a distance you might first mistake this for another of umpteen vulture kettles riding a thermal. 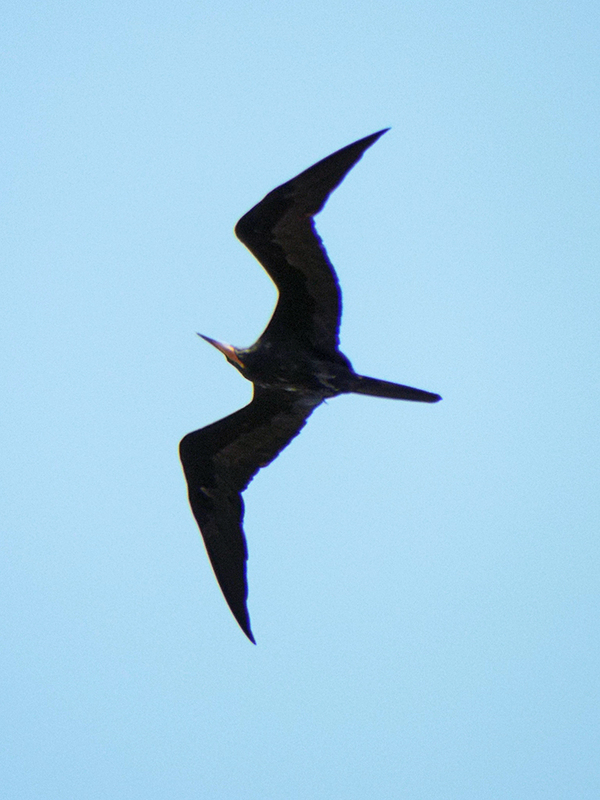 There were at least FIFTY frigatebirds, swirling around, mostly over a residential community outside the park. 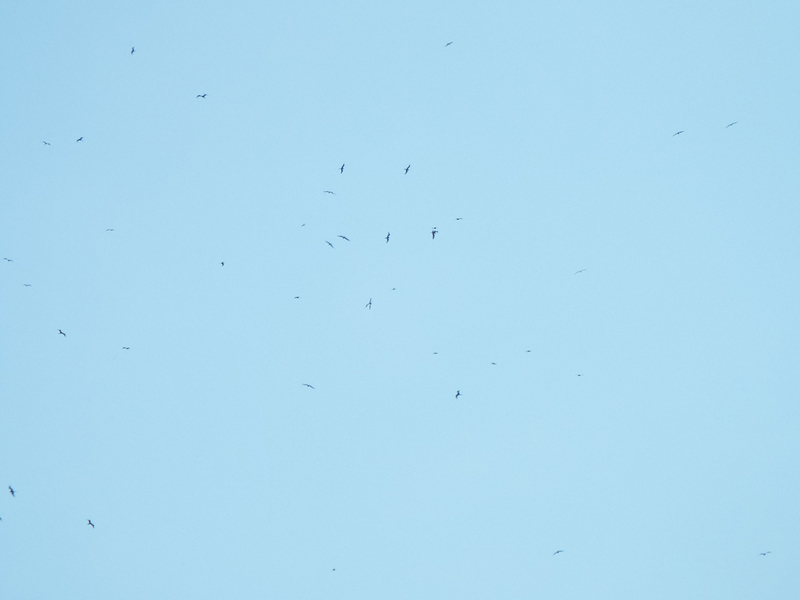 They were surprisingly hard to photograph, even when they swooped down fairly low. Magnificent Frigate birds have a very long wingspan – up to 2.4 meters (8 feet)! Back in the park, there were more mixed flocks of terns and shorebirds on the East Beach, including more Short-billed Dowitchers. 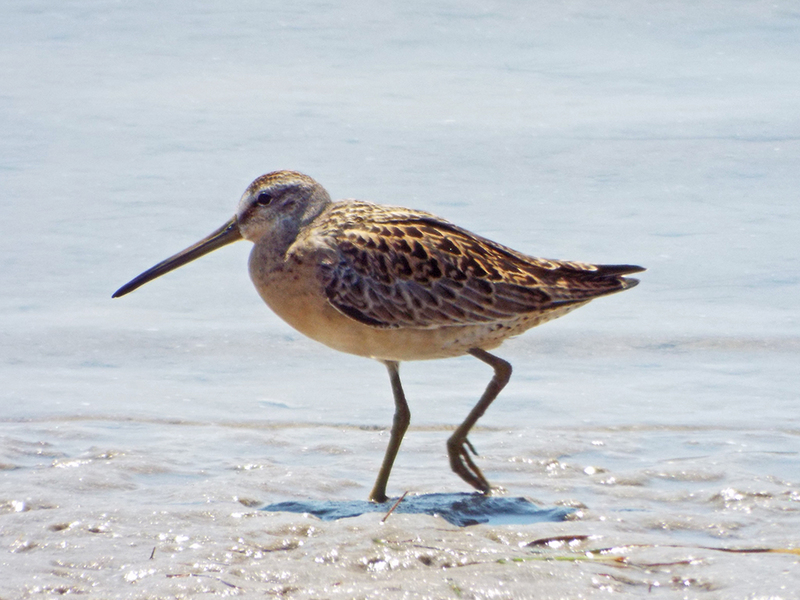 A Short-billed Dowitcher still in (worn) breeding plumage. There was a large assemblage of Brown Pelicans off the East Beach – dozens in large rafts – offshore from East Beach. 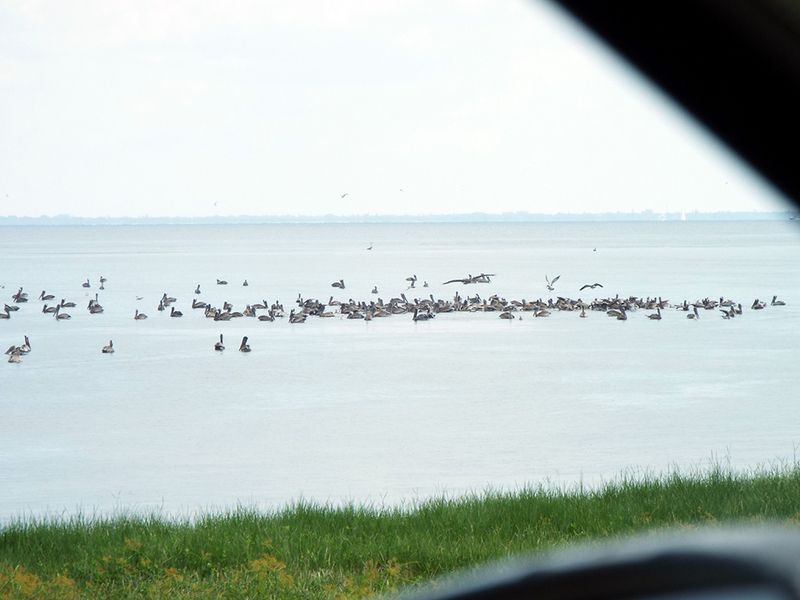 I’ve never seen that many Brown Pelicans in one place. 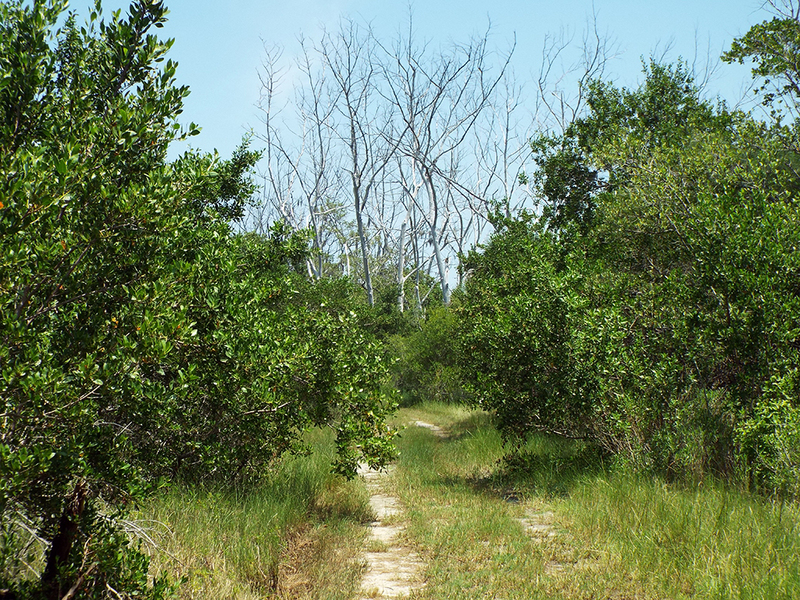 In addition to the beach and mudflat habitats, Fort De Soto Park has some wooded and upland/scrub areas as well. Although it was near the peak heat of the day, we walked through one area in case some early fall migrants were making their way through. 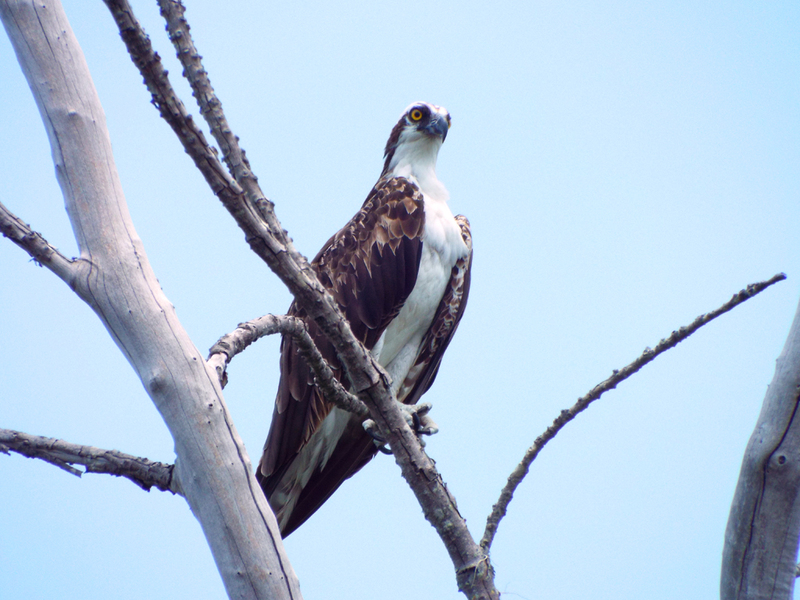 The most we saw were several Ospreys in the dead trees. We did see a few Common Ground-Doves and hear some cardinals, but there were no small passerines anywhere. Our final stop was where Camille had seen probable Great Horned Owls when she visited the week before (a nesting pair is known to be there), but never got a great look. We retraced her steps and came up on a pair of owls! 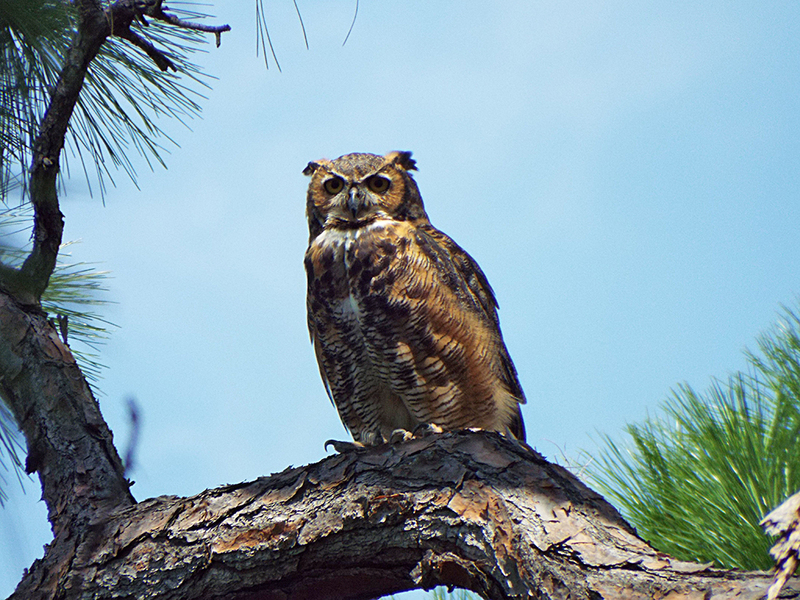 It’s a rare and awe-inspiring sight to see any owl, but to see this large species in broad daylight made my spine tingle. Other than another run at North Beach, showing much the same mix of birds as the morning, that ended the day at Fort De Soto on a super high note! Since there was still some reasonable amount of daylight left, we drove over to Gandy Beach (alongside the Gandy Bridge) to see what might be going on there. This turned out to be a very good decision! 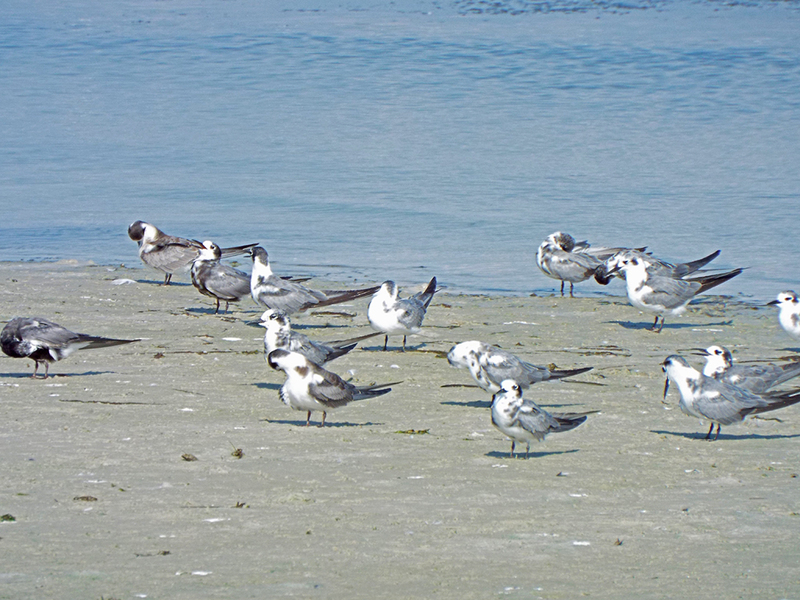 Among the many terns, gull and shorebirds there were a large assemblage of Black Terns (over 100!). I would never have suspected so many. 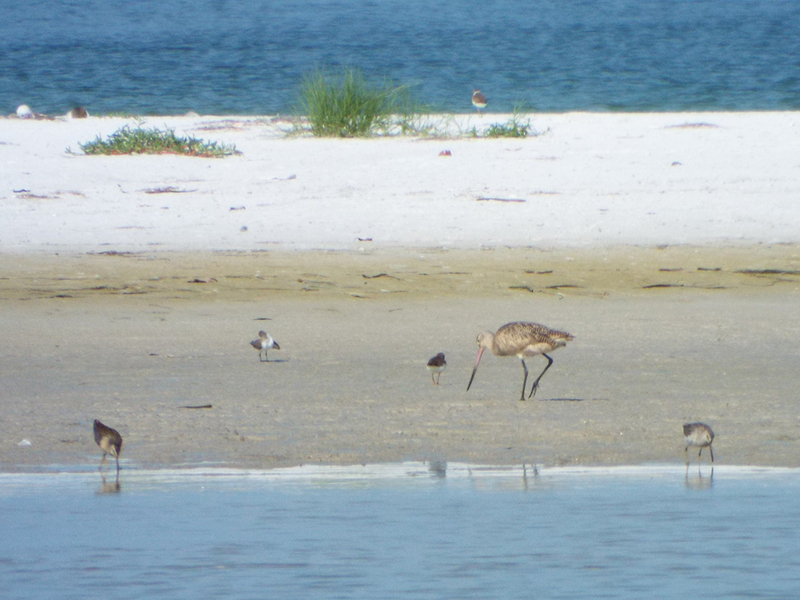 In addition, there was a pair of Wilson’s Plovers, more dowitchers and even a Western Sandpiper. Just a handful of over 100 Black Terns. 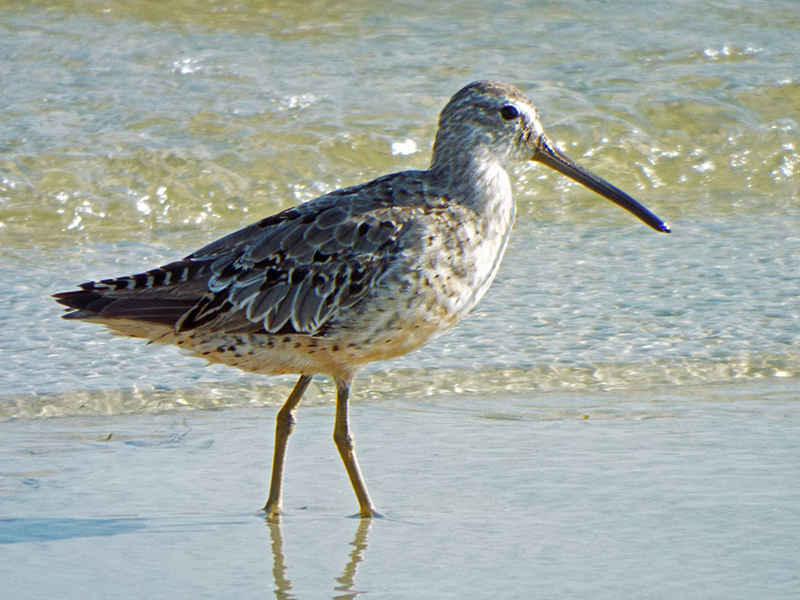 Short-billed Dowitcher in winter plumage. A nice mix of birds. 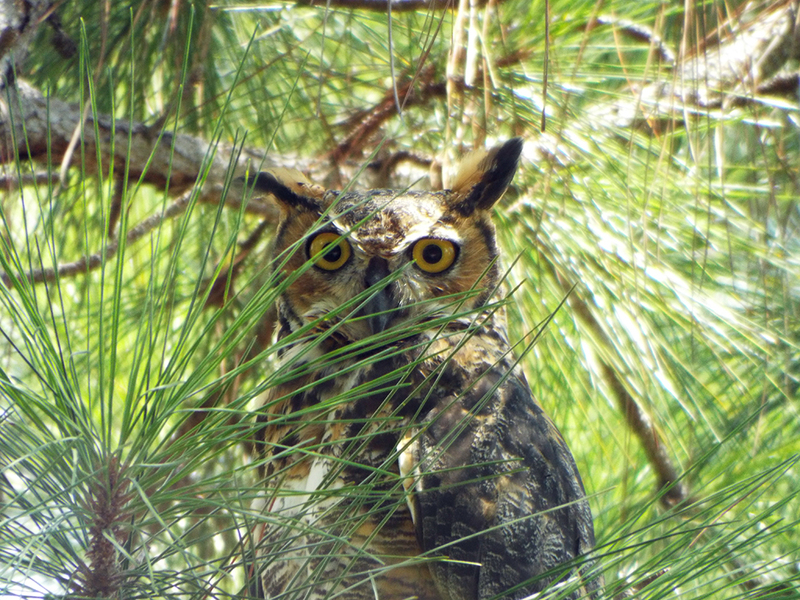 I am really looking forward to coming back to Fort De Soto (and environs) – especially during the spring migration. The legend lived up to the hype, as far as I am concerned. 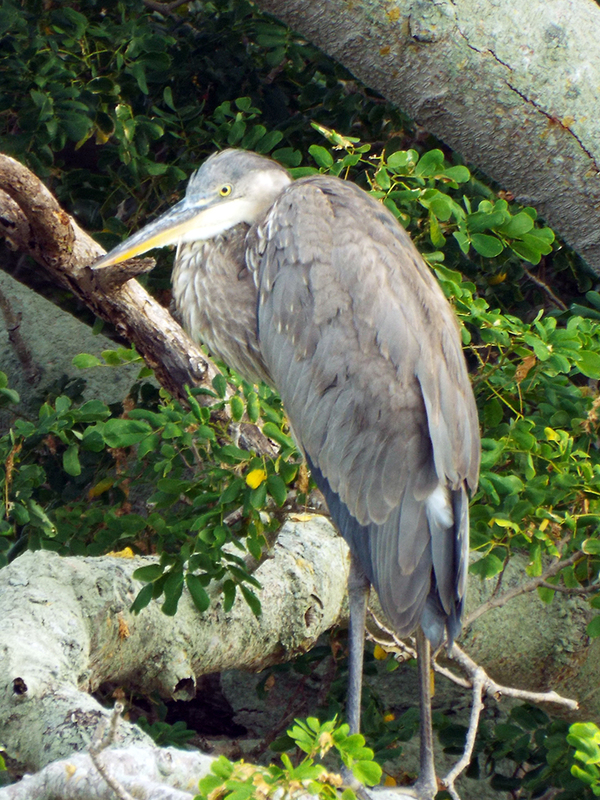 Posted on 2015 August 27 2015 October 15 by Lonely BirderPosted in BirdingTagged Birding, birds, Fort De Soto Park.